Boston Ballet in George Balanchine's 'Stravinsky Violin Concerto' © The George Balanchine Trust. Photo by Liza Voll, courtesy of Boston Ballet. George Balanchine – arguably the one individual most responsible for the American ballet aesthetic. The influence of such frequent restaging of his works, as well as that of New York City Ballet and its training ground, the School of American Ballet (where he was at the helm for decades), cannot be overstated. 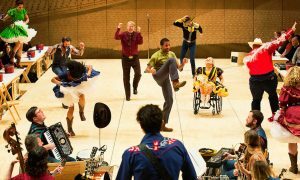 He demanded much of his dancers; “I don’t want people who want to dance…I want people who need to dance,” he’s reported to have said. With a growing awareness of dancer health and wellness, some point to Balanchine as also significantly responsible epidemics of injury and eating disorders, given the precedents he said for desired physical appearance and movement style. Derek Dunn and Lia Cirio in George Balanchine’s ‘Prodigal Son’ © The George Balanchine Trust. Photo by Liza Voll, courtesy of Boston Ballet. Yet Balanchine’s vision was also groundbreaking for its time. His phrase-work, timing and formations are daring, inventive and compelling. His work undoubtedly brought many patrons, funders and aspiring dancers into the field. Viewing these works today, we can hold both of these things in together in our heads at the same time – that aspects of his legacy are problematic, and that his achievements overall were commendable. With honest and accomplished restagings, Boston Ballet certainly offered such a clear-eyed take with Classic Balanchine. The show began with Prodigal Son (1929), an inventive re-telling of this Christian parable. Lights went up on a painted backdrop of simple homes and fields, all with an ancient Biblical feel. Pantomime and movement conveyed the beginning of the plot – a young man (Derek Dunn) wanted from his father what he has been promised, to travel and adventure on his own. Dunn executed a strong yet smooth sequence of stag leaps and a turn with the working leg at 45 degrees. This phrase was repeated, reinforcing this character’s force of will. The next scene included characters with an animalistic feel. They slid in deep second position plié, then jumped straight up with bent knees and flexed feet. Their gestures were rough and enticing. Then entered The Siren (Lia Cirio) – smooth, stately and captivating. She was in head-to-toe fiery red. Dunn’s character was transfixed. Use of a scarf demonstrated Balanchine’s ingenuity; she wrapped it around one leg and, with a popped toe, held it fast as she turned and stepped. Derek Dunn and Boston Ballet in George Balanchine’s ‘Prodigal Son’. © The George Balanchine Trust. Photo by Liza Voll, courtesy of Boston Ballet. While many of Balanchine’s works were plotless, he demonstrated metaphorical astuteness here, this hold of the scarf alluding to the tight hold The Siren held over the main character. The same could be said of the character overall, a human embodiment of the temptations to act for instant gratification. Action intensified as the creature characters stole all he had, even most of his clothes. He stood in a spotlight, nearly naked. It seemed a moment of reckoning. He simply had to change his current state. Dunn’s character returned to his father’s estate (the same set signifying the return to this location). As occurs in the Biblical tale, servants saw him first. The father emerged, and the Prodigal Son character crawled to him, groveling at his feet in reverence and in a seeking of mercy. He rose to his feet, assisted by his father. He jumped into his father’s arms, and the curtain fell on the father carrying him away. I found the absence of the second brother character here intriguing, as that character represents much of the Christian parable’s moral message. This absence perhaps was a wise choice by Balanchine, to help avoid the ballet becoming heavy Christian moralizing. All in all, in movement, structure, and more, this restaging of Balanchine’s work was both enjoyable and thought-provoking. The second work, Stravinsky Violin Concerto (1972), was even more “classic Balanchine”. The offerings of pure movement replaced plot as a central focus. Danseurs wore white tops and black leggings, while the ballerinas wore black leotards and pink tights. Two soloist ballerinas wore black tights, however, signifying their more significant roles. Quick jumps were crisp, raised heels assisting in maintaining the speed. Raised hips and other non-traditional adjustments lengthened and exaggerated lines. John Lam and Kathleen Breen Combes in George Balanchine’s ‘Stravinsky Violin Concerto’. © The George Balanchine Trust. Photo by Liza Voll, courtesy of Boston Ballet. On one level, part of me is always concerned with the wear-and-tear on dancers’ joints that this neoclassical style can cause. Another part is continually fascinated by the ingenuity of Balanchine’s images. In this performance, I was also impressed by Boston Ballet dancers’ versatility. They seemed perfectly comfortable in the nuances of the style, as if dancing and training primarily in it for years. Whatever this company dances, they do it 100 percent – no shortcuts, no lapses, no weak links in the chain. The work began with a pinch of postmodernism – the dancers standing in one line, poised but motionless. As the seconds ticked by, it was hard not to wonder when they would begin to dance. In a flash, they raised arms to a “V” to join hands. The solo ballerina (with four danseurs, two on each side of her) raised up on pointe to battement forward and then execute other intricate footwork. The section continued to feature her, the four danseurs behind her in support. “Ballet is woman,” Balanchine is said to have asserted. Particularly memorable were quick hip shifts and low attitude shapes, becoming digestible accents to rather fast movement. A following section reversed the gender structure, with four ballerinas and one danseur. Just as the first section began with an implication of unity, they entered in a long line with joined hands. This connection offered a heartwarming sense of play and joy. Two pas de deux followed this section. In the first, “Aria I”, Kathleen Breen Combes and John Lam were both grounded and light. 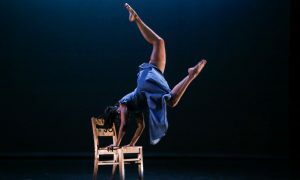 The choreography was intriguingly peppered with movement and stylistic flourishes from other forms, such as acrobatics with walking in and out of a Wheel Pose shape, and jazz dance with accented reaching of jazz hands. In “Aria II”, Maria Baranova and Paul Craig performed some virtuosic movement, but also softer and slower moments. 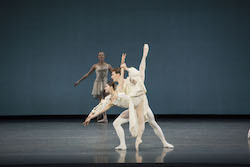 Misa Kuranaga and Patrick Yocum in George Balanchine’s ‘Chaconne’. © The George Balanchine Trust. Photo by Liza Voll; courtesy of Boston Ballet. Craig offered a gentle embrace at her shoulders, and Baranova leaned back into him – initiating them rolling torsos. As is the case with much of Balanchine’s movement, this was more about nuance than about size. As discussed, how physically safe executing this nuance is, at Balanchine’s intended speed, is a valid conversation to have – that is, if dancers having long and healthy careers is a priority. And I believe it should be. An ensemble section ended the work, with fast footwork and small jumps offering a refined, yet folksy feel. It all went back to that sense of connection. 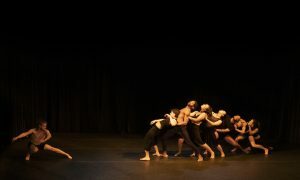 The work ended with the ensemble facing outward proudly, the joy of movement lifting their hearts high. The feeling was infectious. Chaconne ended the night, bringing me into its ethereal dream world. A blue and white color scheme, including a backdrop reminiscing billowy clouds, helped build this feeling. This paired with the breezy, meandering music (from Christoph Willibald von Gluck, ballet music from the opera Orfeo ed Euridice, 1762), a spiritual feeling prevailed. It was like a tiny glimpse into traditional depictions of heaven. I thought of the section in Jennifer Homans’s book Apollo Angels, when she discusses how classical dancemakers believed dancing could bring humans closer to God. 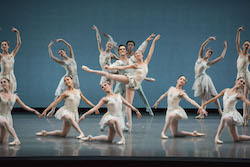 Boston Ballet in George Balanchine’s ‘Chaconne’. © The George Balanchine Trust. Photo by Liza Voll; courtesy of Boston Ballet. The choreography was a bit slower, with fewer hip shifts and speedy jumps. Yet Balanchine signatures, such as a raised hip to increase the height of an arabesque and feet crossing the stranding leg in passe, were still clear. Patrick Yocum executed an elegant ballon. Misa Kuranga’s lines were clear and beautifully energized. The ensemble performed movement of moving through fourth position, sweeping the front arm under and forward, to then bourree in higher space. Other moments, such as a circle coming together at center stage to then expand into another formation, were wonderfully harmonious. Still, that intriguing Balanchine signature – arguably prioritizing shape and line over what is itself harmonious in the body – remained. With bodies of work such as Balanchine’s, those that live on far past their creators, let us strive to honor the achievement within them but also critique them with wisdom and discernment.